A new slant on the equestrian holiday, aimed at people who want to take their riding to a different level. and really enjoy – competition-level riding. We offer 2 or 3 days of intensive coaching, culminating in an escorted trip to an open competition where you will enter 1 or 2 classes suited to your ability and compete with the full support of our team. We can’t guarantee you a rosette, but we’re pretty sure you’ll leave having enjoyed yourself and have learned a lot be 10-feet tall and smile for a week. For best results, we prefer to limit the group size to a maximum of 2 riders of similar ability. However, small groups can be accommodated on request. · Basic riding ability. Please note, these courses are not suitable for absolute novices. 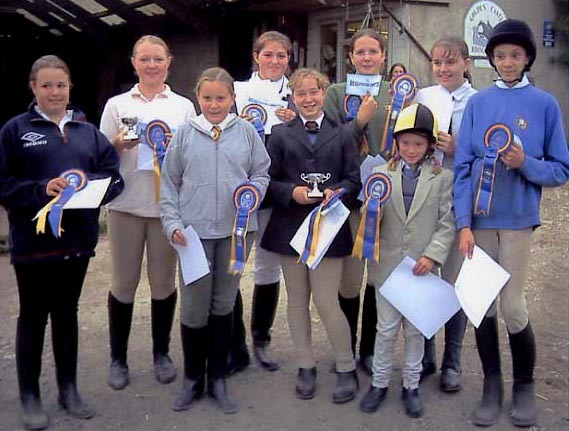 The competitions we enter are all unaffiliated, so you do not need to be a member of any governing body. However, we do recommend BHS membership and that you are insured. Some disciplines/events require booking and competition entry fees to be paid well in advance, but as a rule, show jumping and cross-country competitions are easy to book at short notice. · Detailed instruction by qualified instructors. · Transport to and from the competition venue. · Bed & breakfast accommodation at a local inn. * Or you can bring your own horse and tack. £ 150 per day, plus competition entry fees (usually around £5-£20 per class). A deposit of £50** (plus entry fees if necessary) is payable when you send in your completed booking form, with the balance payable 2 weeks before your arrival. ** Fully refundable up to 2 weeks before your arrival. For more information and a booking form, please contact us.